The house next door was once a dastardly shade of pink, with rotting and peeling shingles. It stood empty for months on end, devoid of human voices or the mirth of children’s laughter. For decades, the house was an ailing eyesore, a waning beauty in Asheville’s Montford neighborhood. But to the Palmes, a young family then living nearby, it looked like home. Harli and Kevin Palme, parents to Mattie Clark (10), Pearl (6), and Vivi (2), had often passed by the house on family walks. “The thought would cross our minds, ‘We’d love to get that house some day,’” says Kevin, an artist. At the time, they lived in a smaller, late-1950s home just outside of Montford’s historic district in Asheville. “Once Vivi was born, we realized long-term we wanted a yard and more space, and that we wanted to stay in Montford,” says Harli, who works as a financial planner. Covering some 300 acres with more than 600 structures within its boundaries, Montford is a mix of young families, students, tony bed and breakfasts, long-time neighbors in both manses and bungalows, a smattering of subsidized housing, and handsome old apartment buildings. In this neighborhood—which hosts its own arts festival, is serviced by city schools, and has parks, community gardens, and three restaurants—they would be wanting for very little. So the search was on the for the perfect home in which to raise their children. As thoughts kept returning to the old Dutch colonial-style dwelling, they finally made an appointment to view it in October 2012. The bones of the 1905 home were fine, but much else was in disrepair. Rooms had been carved up into smaller ones with awkward partitions. The wraparound front porch was half its original size, thanks to a crude addition with thin walls and narrow, aluminum-framed crank windows. Large tiles, wall-to-wall carpet, and linoleum covered the original heart pine wood floors, and the exterior’s generous front and back yards were covered in brambles, weeds, and powdery dirt. “From the time we first saw the house, we felt, ‘We are young and enthusiastic; we could do that,’” Harli recalls thinking about the major renovation this home would need. Their old house had fared well under Kevin’s handiness, and they weren’t afraid to dig into how-to books and research a plan to take action. In July 2013, the sale closed, and six months later they moved in, but not before major renovations consumed their lives. Kevin worked on the roof and collaborated with contractor Ward Griffin on the major changes in the home. A multitude of structural elements, including all of the plumbing, was replaced. The family opened up the kitchen, leaving detail work in the doorway but refurbishing the entire space with shiny blue cabinets. 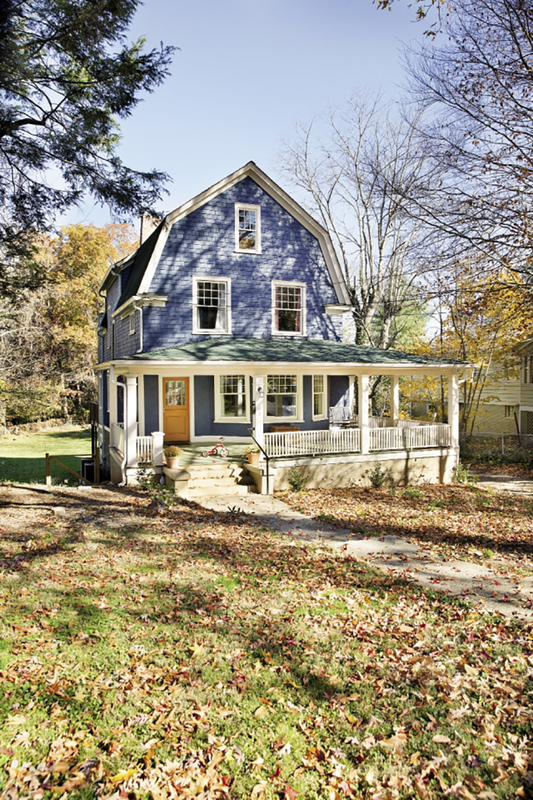 The cedar shake siding on the exterior, likewise, became an extraordinary deep blue. Other concepts came from modern design influences like Dwell magazine and art that Kevin had traded with friends or that the couple had collected since meeting in 1997. Kevin, who had volunteered with Habitat for Humanity to build homes, says he was able to “pick some things up here and there” and keep costs down by doing much of the work himself. Being in the historic district also means applying to the Historic Resources Commission for any changes to the exterior of the structure. The Palmes changed 19 old windows to vinyl replacement ones with the proper historical look. They donated 11 cast iron radiators and installed an HVAC system. With three small children, a new laundry room and mudroom were a must. Modernizing the 2,355-square-foot home also took place in the décor. The Palmes’ lifestyle and aesthetic are uncluttered, unfettered, clean, and clear. Original tiles on the mantles stand out, rather than being hidden by heavy furniture. And the pieces that are in the home actually lean toward mid-century, rather than turn-of-the-century. Only meaningful pieces of art hang on the walls, including Kevin’s own serene canvas panels with shifting fields of color. A 1964 Frank Stella screen print acquired at an antique shop sits above a dining room mantle. A Tibetan love knot hangs suspended between glass in the couple’s bedroom, along with other tapestries and prints hung from the picture molding in spare increments around the house. Only the girls’ rooms, spread between the second and half-floor above, showcase brighter colors like lettuce green and pink accents. The Palmes kept carpeting in the upper floor play space, perfect for games and unfurled sleeping bags. Set on .35 acres, the lot has received a lovely cosmetic treatment of new fruit trees and linen-white hydrangea bushes in front of the wide porch—all planted by Kevin, who also constructed a new backyard fence to contain the children and a new puppy. He laid a brick walkway that leads from the driveway to the back patio in the shadow of the reconstructed garage-shed. This, Kevin renovated as well, with plans for much more … and a lifetime to convert the house next door into a forever home.